Reggie Jackson with Nurturing Diversity Partners spoke to our club at this weeks meeting. If you were expecting Mr. October, hopefully you were pleasantly surprised with the opportunity to instead learn about the history of segregation in Milwaukee, and discuss the obstacles and hurdles people of color have had to face in breaking the segregation. There is still work to be done. Nurturing Diversity Partners is a program of Jackson-Kaplan Consulting LLC, providing education, training, and consulting services that foster diversity inclusion, and equity within institutions and the greater society. Reggie has served as the Head Griot (docent/oral historian) for America's Black Holocaust Museum (ABHM) since 2002, during which time he has become a much sought-after public speaker, researcher and writer for regional and national media. Reggie has has garnered numerous awards for his work creating and facilitating public history programs, workshops, and interracial dialogues. 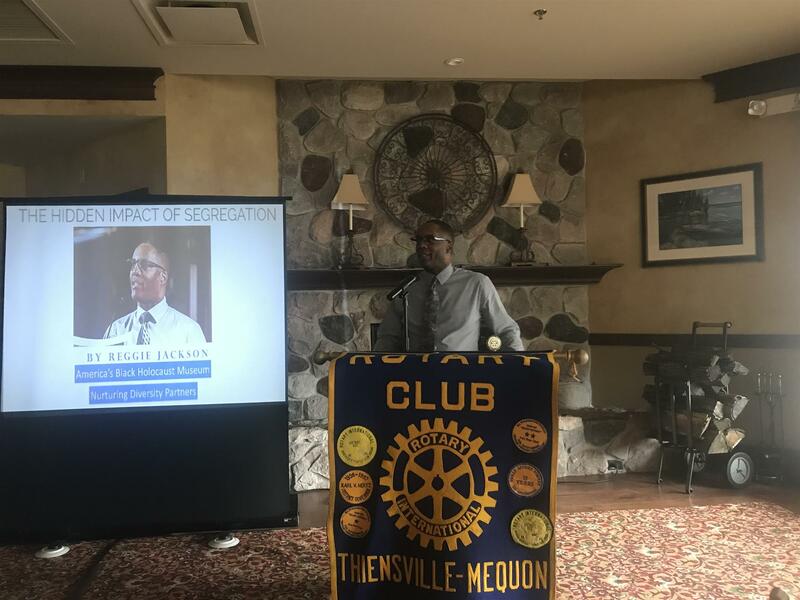 Thank you Reggie for taking the time to speak to our club, and for the important work you are doing in our community.